Yoga Sessions are being held at Mad Dog Artist Studios now. Led by Yoga instructor Elizabeth Kennedy, beginning / progressive yoga instruction started in September, 2018 at Mad Dog Artist Studios. Liz's classes will be focused on the beginning yoga student and progress in content as the classes' ability and interest does. Her classes and teaching technique are such to provide newcomers to yoga with a very approachable introduction to yoga. This program is designed to meet the needs of people living and / or working in the Armory Arts District. Mad Dog will run three series of yoga sessions (Fall, Winter and Spring) over the course of the year. All sessions will be held on Wednesdays. As interest and popularity grow we will add sessions and additional days of the week as we can. Is Mad Dog becoming a yoga studio? No. We are just meeting the needs and interests of our members and those other creative types living and working in our community. We are an art community that helps our members and friends explore all avenues of art, culture and well-being. Liz conducts an 8:15 AM to 9:00 AM "Morning Class" with an optional fifteen minute relaxation and meditation segment ending at 9:15 AM. Liz also offers a 12:15 PM to 1:00 PM "Noon Class" with an optional fifteen minute relaxation and meditation segment ending at 1:15 PM. This class is designed to accommodate the lunch schedules of people working in the Armory Arts District. IDEA: Consider placing your lunch order at the café counter with Christina at Mad Dog Café as you enter our building. It will be ready for you to pick up on the way out after your yoga session has ended. The classes feature 45 minutes of Hatha Yoga active movement with a focus on posture and learning the correct posture... finding the perfect place for your body within that posture with gentle guidance. This class will be appropriate for beginners to experienced yoga students. At the conclusion of the class there will be an optional 15 minutes of relaxation and meditation. The focus of Liz's classes will be to: regain strength, increase balance, increase concentration, learning breath control, increase body awareness and correct postural alignment... fighting gravity. You may register for individual sessions or purchase multiple-session discounted registration packages here. Walk-ins will be permitted as space permits. $13.per session fee with the purchase of our "Guest Ten (10) Session Package" for $130. $11. per session fee with the purchase of our "Mad Dog Studio Member Ten (10) Session Package" for $110. 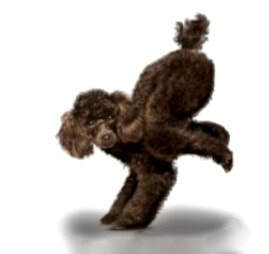 If these two Mad Dogs can do it... you can be a Yoga Mad Dog too. NOTE: WINTER SERIES classes run 1/9/2019 until 3/27/2019. SPRING SERIES classes run 5/1/2019 until 6/19/2019. Unused pre-paid sessions (Ten Pack) can be carried over to another series.